This piece will go into depth in explaining a trending term in the football world. Not only will it go over the thorough explanation of the term, but also explore the complexity of such , give it a clear label in the football world, identify players that fall under its category, and show detailed illustrations of the characteristics that the term involves via picture-analysis. The term Raumdeuter has been undergoing a considerable growth in exposure among football fans across social media. So what is a Raumdeuter, and how does it relate to football? For starters, the term, in German, translates to something along the lines of “space interpreter or space investigator’’ (raumdeuter.com). It gained its relevance in football with the term becoming a label for German attacker Thomas Muller. Now, considering the term and the player have a direct relationship, other players that are ought to be considered under the same category must have similar characteristics to Muller. That is not easy at all. The World Cup winner is a very peculiar player, unlike most of this generation. He is unorthodox in his movements, has superior anticipation and reading of the game, possesses significant aerial dominance and can be a constant scoring threat to the opposition. 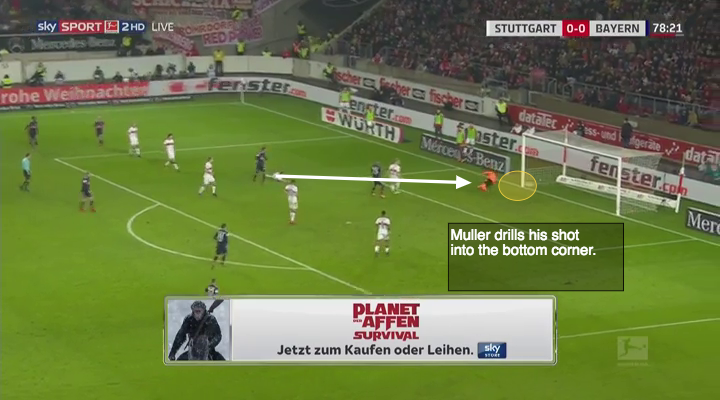 Curiously, what Muller is most known for is his interpretation of space on the pitch to create advantageous situations. Raumdeuters basically utilize their quick processing of the game to get themselves into favorable situations, usually going unnoticed by the opposition. As Oliver Young-Myles stated in his Squawka piece on Raumdeuters, in reference to their ability to get into undefendable situations: “He [Raumdeuter] is difficult for defenders to pick up as he will often drift from his assigned position looking for any opportunity to exploit.” Combine their interpretation of space with a privileged first touch and killer finishing, and defenders have themselves a mighty challenge in hand. Thomas Muller is neither a wide player, nor a midfielder, nor a striker, although he is regularly named as one of those during Bayern’s starting lineups as seen on paper. So what position do Raumdeuters play? Are they center forwards, side forwards, central attacking midfielders, or strikers? In reality, the Raumdeuter is not a position, it is a role. One that is massively dependent on a specific system and relies heavily on being surrounded by talent to thrive. Normally, they occupy wide positions on the field such as a right forward or left wing, but a Raumdeuter could perfectly play in central areas. Now that it’s understood that Raumdeuters are not linked to a specific position, but rather to a role, a question must be raised: What role do they have? As described on Squawka, “his main role is to find pockets of space in which to operate. Essentially a wide poacher, the Raumdeuter takes up seemingly harmless positions out wide, waiting for the opportune moment to burst through the defensive line for that telling shot or cross” (Young-Myles, 2016). They play little role in the team’s build-up, and are a main end-product provider for their teams. Next, it’s necessary to break down Muller as a player to clearly label the characteristics Raumdeuters should possess as football players. First of all, they are clumsy and do not hold an aesthetically pleasing technique or style of play. They are limited dribblers, and are not characterized by their pace. 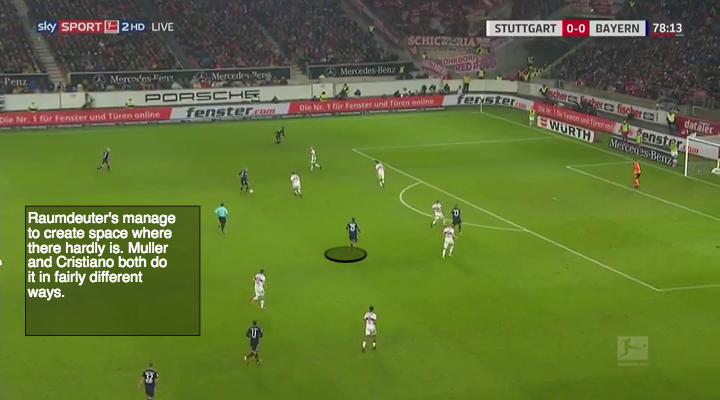 Their first touch is very efficient, and is a huge contributor to their set-up touches prior to scoring. They have good aerial capabilities, and have relative ease to put the ball in the back of the net with their head. As previously mentioned, they get into advantageous situations by combining their remarkable anticipation with their superior reading of the game. Defensively, they are fairly decent at orienting presses, but for the most part, they don’t play big defensive roles for their teams. After understanding the Raumdeuters role and characteristics, it’s time to get into specifics. Who are 2 players, aside from Muller, that fit the descriptions above? The first might be fairly obvious to some. Already labelled by a select group as the English Thomas Muller, Dele Alli’s characteristics certainly fit under those required to be considered a Raumdeuter. 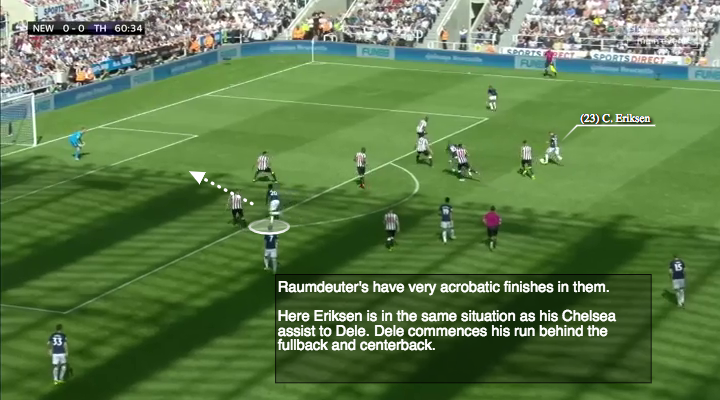 As @mrraumdeuter explains, Dele is great at finishing with his head, as he showed during a home display against Chelsea where he bagged two of ‘Eriksen’s whipped crosses’ in with his head. Another way in which they are similar, @mrraumdeuter highlights, is that neither hold an aesthetic technique. 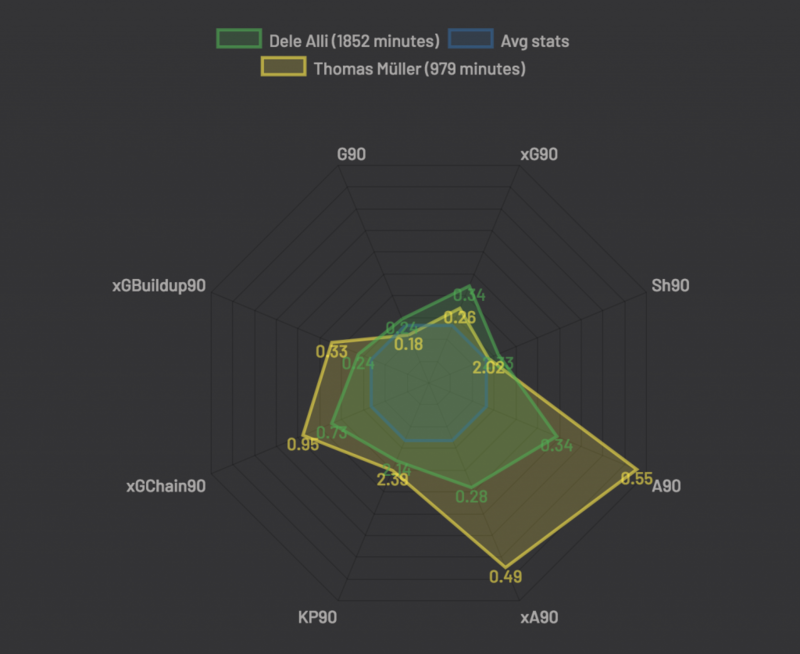 This player radar comparison (via Understat.com) shows vast similarity between Muller and Dele. Here is their attacking player radar from this season including offensive contribution such as goals, assists, key passes/90 (KP90), expected goals and assist, and other more complex measures such as xGChain90 and xGBuildUp90. What xGChain90 refers to is the total xG of every possession the player is involved per 90 minutes. As for the other complicated measurement, xGBuildUp90 refers to the total xG the specific player is involved in excluding key passes and shots per 90 minutes. As the radar shows, they’ve shown significant similarities this season. Their KP90 varies only .25, with Muller’s being at 2.39, while Dele’s is at 2.14. Their G90 and xG90 show similarities, with the Englishman having a slightly higher involvement with scoring. Their shots and xGBuildup90 are also similar. The biggest difference comes in the assisting category, with Muller having an immense advantage over Dele. However, it might be noted that Muller’s minutes are nearly half of Dele’s this season, so his stats could be somewhat distorted. For a larger and more accurate scale, here’s their last 3 seasons. Even though the first radar does show some similarities, this radar confirms how similar their attacking statistics are. The shape is nearly identical, with the German coming across as superior in every stat. Now the other player that will be looked at, is perhaps a controversial one to consider a Raumdeuter. Mostly because he started his career as a pacey winger with insane dribbling. However, only after his age started affecting is playing style did he have to accustom himself into developing Raumdeuter characteristics. That player is Cristiano Ronaldo. Ronaldo’s dribbling times are far from gone. Although he can occasionally go on good dribbling runs during isolated moments, his dribbling frequency and efficiency this season doesn’t even position him in the top 300 dribblers in Europe. Harry Maguire – only centre back in the list. This graph by @gubaja shows the top dribblers in Europe in regards of successful dribbles per 90 minutes and dribbling success rate. As mentioned, Ronaldo doesn’t even make the top 352 players. Quite curiously, Alli ranks as one of the worst dribblers on the list, completing just 1.2 successful dribbles per 90 minutes, with a significantly low efficiency rating of 38%. Aside from his dribbling, Ronaldo’s style of play might not seem unorthodox to most. With that said, his technique in the last 2 seasons has changed massively to fit his physical demands. He seems uncomfortable on the ball at times, and no longer possesses explosive pace like he once did. Rather, he has increased his reading of the game, occupying spaces far better than in his earlier stages in his career. His first touch to set up his finishes are brilliant, his heading is world class, and his ability to put himself into scoring situations is simply the best this generation has seen. All these traits scream one thing: Raumdeuter. Now that the term has been thoroughly explained, and the players have been determined, let’s turn to image-illustrations to further understand how Raumdeuters can cause damage to oppositions. Heat maps (Wyscout) can say quite a lot about players. Raumdeuters generally operate from the wing inward. They have massive participation in half-spaces as well. Their presence in the box is also illustrated by these maps. 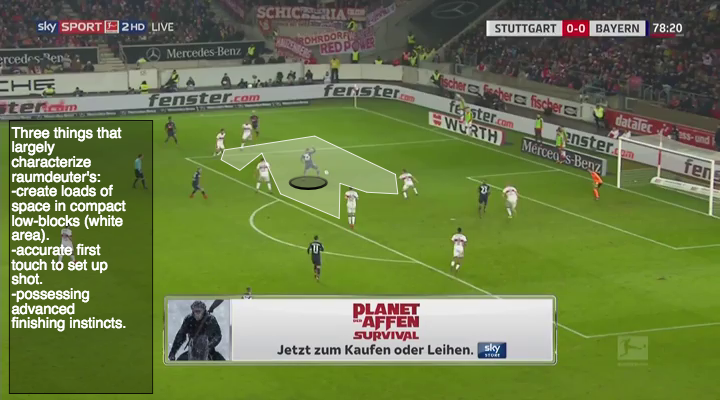 After arriving delayed into the attack, Muller goes unnoticed by the opposition at the time of Alaba’s cross. To lose his markers sight, he purposely goes behind them- into an offsides position. Now he has all the time and space to control and finish. So again, excellent interpretation of space to create it in compact low-blocks, a precise first touch, and a killer finish: all traits that will become constantly showcased throughout this article. Raumdeuters are always a step ahead of the opposition. Their brilliant reading of the game allows them to predict actions before happening, and can therefore act upon it quicker than others. 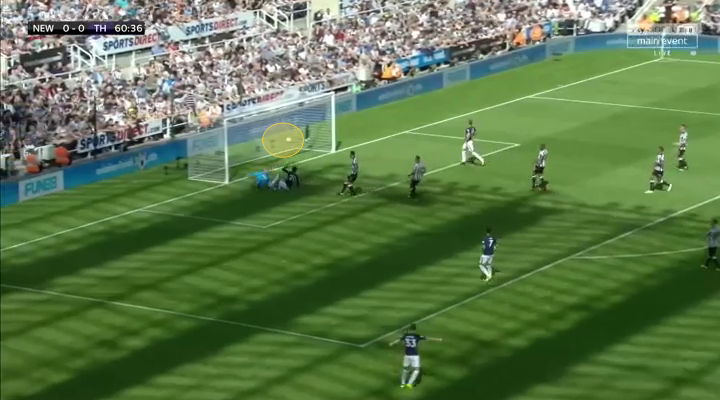 As Eriksen’s free kick cross is played into the box, everyone except Alli runs for the ball. The Englishman, instead, delays his movement, waiting for any possible clearances to come his way. 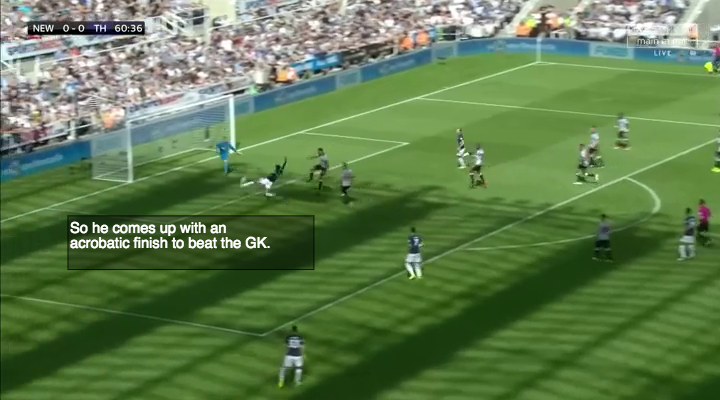 Surely enough, the ball was cleared towards him..
By anticipating where the second ball would go, he beat everyone to the rebound and riffled the ball past the GK. 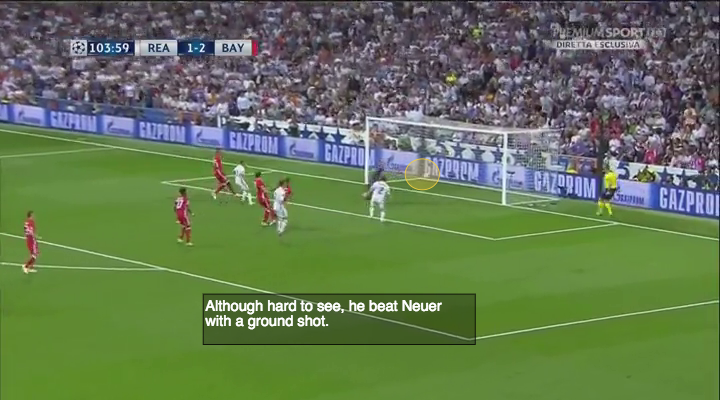 For a better example, Thomas Muller is a master of the arts at anticipating everyone else on the pitch. 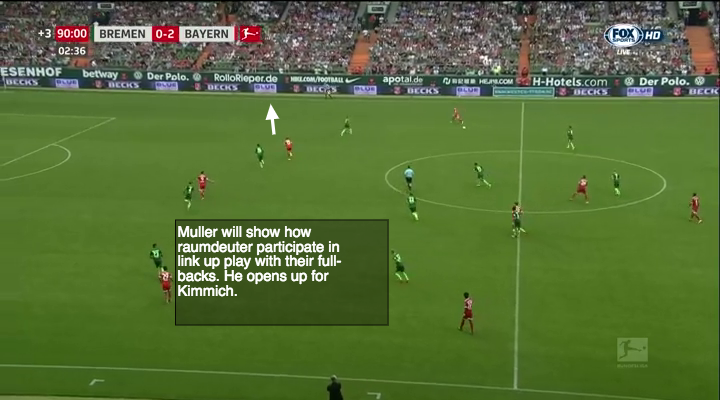 The back 5 is looking at the ball possessor, while Muller already commences his run behind the line. Although he was various seconds in front of the opposition to receive the ball, he had to wait a significant amount of time because the pass was floated in the air. 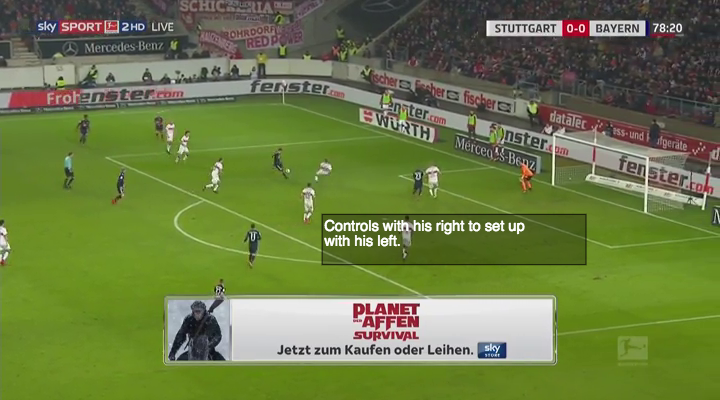 Muller used his brilliant first touch to set himself up. Then he lays off a calm finish to beat the goalkeeper. Again, his anticipation allowed him to get himself into an undefendable situation. As mentioned countless times during this article, Raumdeuters are fantastic at getting into scoring situations via anticipations, reading of the game, and smart movements. These examples will showcase how their movement inside the box is used as a tool to get themselves into advantageous situations. 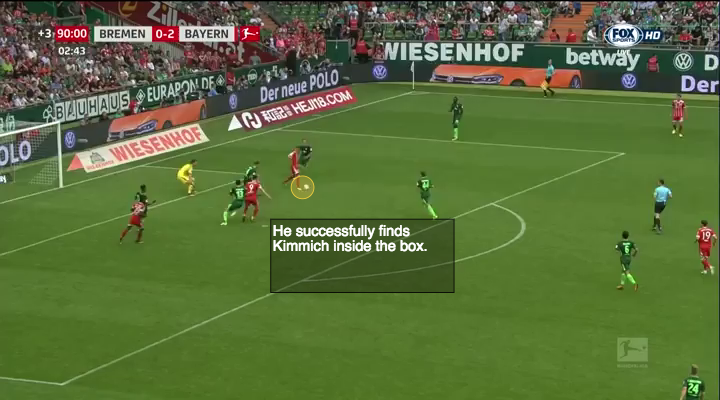 He fakes a run outside, to then switch directions and cut inside. He’s left with a nearly-open net; an easy finish for Dele to convert. An extremely common trait in Raumdeuters runs while constantly changing directions is to decelerate massively until nearly stopping. By slowing down, everyone who is going quicker moves away, creating space for themselves to cause damage in. As soon as Cristiano recognizes a favorable situation, he stops his run. He will now trust his teammate to get the ball to him. When the cross is played, he attacks the ball with perfect timing. Cristiano rips it into the top corner of the goal. So by now it’s probably evident that a constant in their voyage to getting into scoring position involves lots of changes of direction in their runs. 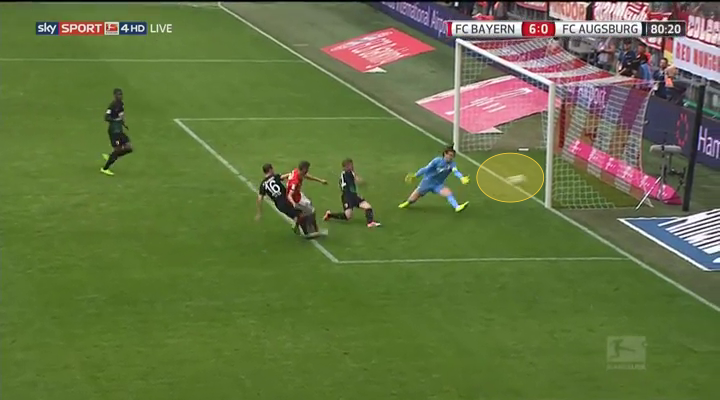 This not only confuses defenders, and makes Raumdeuters extremely hard to mark. Ronaldo finds the back of the net after performing a towering header to beat Valencias defense and GK. Which automatically leads us to our next section, heading. As all 3 players in this article have shown throughout their careers, they have no problem when finishing with their head. With the help of their brilliant placement, and also because they understand their teammates characteristics and strengths to perfection, Raumdeuters get into wonderful scoring situations. 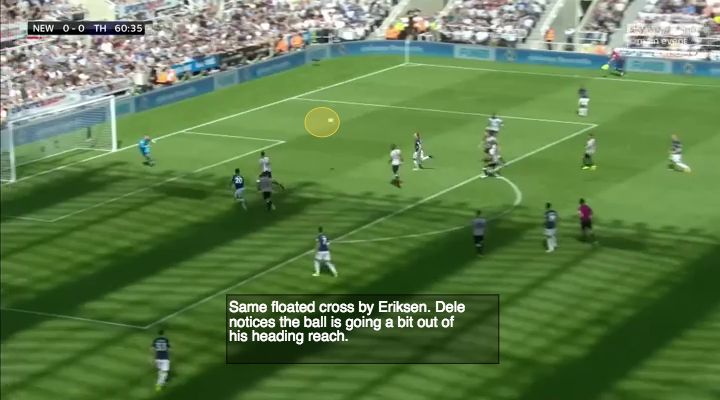 Dele Alli knows Eriksen is in his sweet spot to whip in a cross from the half-space. 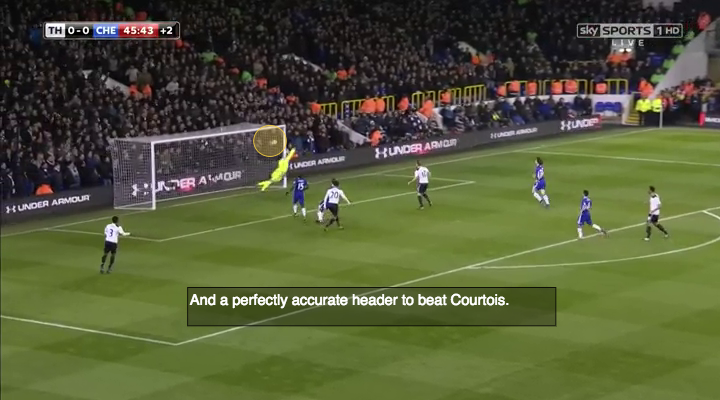 So he gets himself into a position to bang in Eriksen’s cross into the far corner of Courtois’ net. 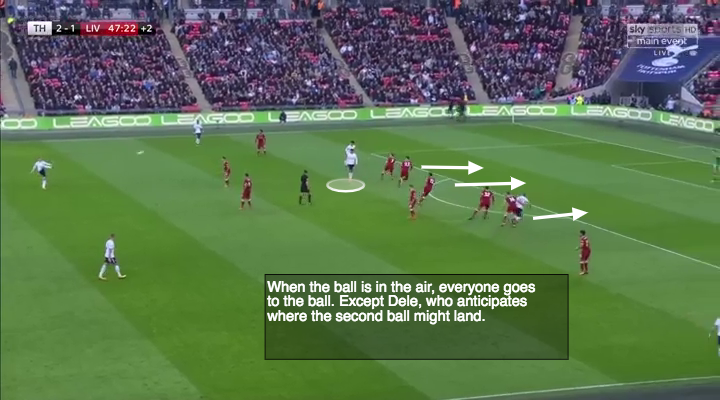 Speaking of the Eriksen-Dele Alli association from the half-space into the box, this example will see the Englishman’s acrobatic finish- a common trait within Raumdeuters. At this moment, Dele realizes he can’t head the ball in. Therefore, he changes his body language to try to stretch himself as much as possible. In the end, he is capable of beating the goalkeeper with a bouncing shot. Again, Raumdeuters can finish in a variety of ways. Its part of the reason why they are so complicated to defend against. 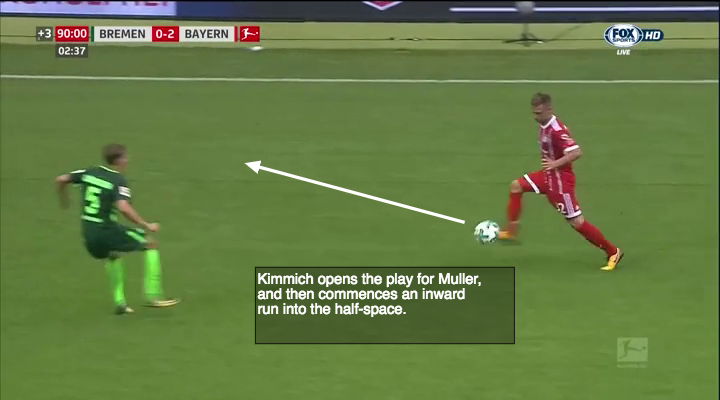 As a player with brilliant spatial awareness regularly does, Muller looks up to spot Kimmich. Quite similarly, here is Ronaldo doing the same with Carvajal. Same as Kimmich did with Muller, Carvajal opens up the ball to Cristiano. The Spanish right back then performs a run into Atleti’s box. Both plays show a common trend explained above. 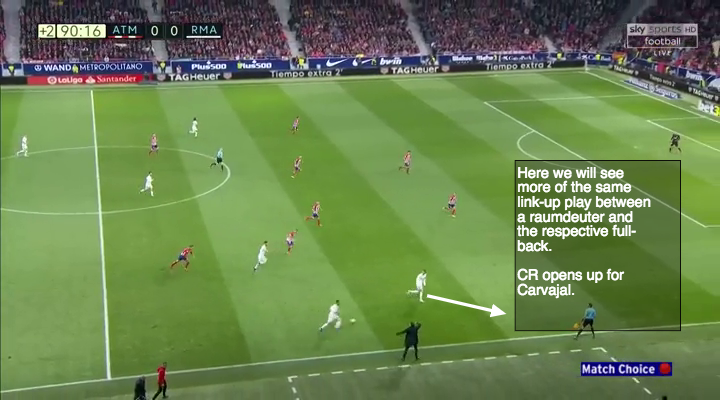 A movement by a Raumdeuter into the space, the full-back in proximity looking for them, expecting and receiving a pass back to satisfy their emerging runs. Although the term Raumdeuter can be often misused, hopefully this detailed explanation and analysis helps readers and football fans understand what the term means, what role they play, and what characteristics a should player possess to fit into such category. To conclude in general terms, a Raumdeuter is good in the air, has a great set-up first touch, superior finishing instincts, an unorthodox or unpleasing technique, and, most importantly, the ability to interpret and manipulate space like no other. They are neither fast nor good dribblers, and rely on their intelligent movements to get into favorable situations. Finally, they provide significant end-production to their teams when surrounded by the correct group of players.